October is my favorite month. Halloween is my most creative and most favorite time of year. 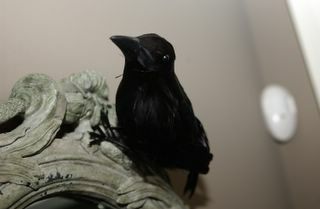 The crows have moved into the house and soon the Goblins and Witches will appear. Autumn is barely on the radar here but no matter, it is time to get ready for Pumpkins, Chill and of course Sweaters. But first I have to check the house for Ghouls and Ghosts. On a knitting note: You know what really scrapes my plate? When you pay $16 for a ball of SuperChunky Cashmerino (If your initials are D.B., listen up! )and there is a broken strand of yarn that has been tied off. I have worked through 3 balls of the stuff and 2 of the 3 have had tie offs. This is just Bad Form and really is aggravating. I am happy to pay for well made yarn and well balled yarns, but this does not get my vote. I mean, if you want me to pay your prices, can’t you at least treat me nicely? Send the company a note. A company who wants to be accountable to their customers will take action. $16 for yarn with knots is ridiculous! If I want knots in my yarn I can make them myself and use cheaper yarn to begin with! Thanks for your comment about the quilt. Glad the colours inspired you.I’ve been told by someone who works for Rowan in the UK that the industry standard is a maximum of 3 knots per balls. Any more than that is unacceptable & you have a case as a consumer. I’m so used to it happening that I’m only mildly irritated, but I think 3 per ball is ridiculous. Maybe we should all get a little angrier about it! « More like Lookie What I Got!